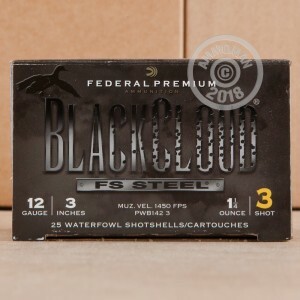 These Federal Black Cloud 12 gauge shotshells are a "cutting edge" choice for waterfowl hunting--they fire a mixture of conventional #3 steel shot and Flitestopper sharp pellets designed to produce additional penetration for more reliable terminal performance. Each 3" shell fires a 1-1/4 payload of #3 birdshot at a muzzle velocity of 1,450 feet per second. Black Cloud shells are loaded in Anoka, Minnesota and use lead-free components. Each box contains 25 shells. 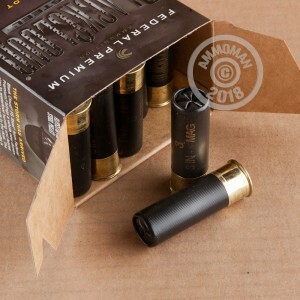 Avid hunters take note: AmmoMan.com provides free shipping for all orders over $99.